Edward Willett, Paths to the Stars. Self-published, 2018. Pp. 310. ISBN 978-1-9993827-0-4. US$15.95/CAN$19.95. An ex-actor who has his own reasons for no longer wanting to be involved in theatre is coerced into directing a production of The Sound of Music aboard a passenger ship. Two translators overcome their mutual feelings of revulsion to work together for the greater good. Odd vegetables cause an explosive situation in a small Saskatchewan community. These are just a few of plot lines featured in Paths to the Stars, a short story collection by Edward Willett. Author of over 60 books, ranging from science fiction and fantasy to non-fiction, and better known as a novelist than a short story writer, Willett has nevertheless written shorter pieces at various points along the way. 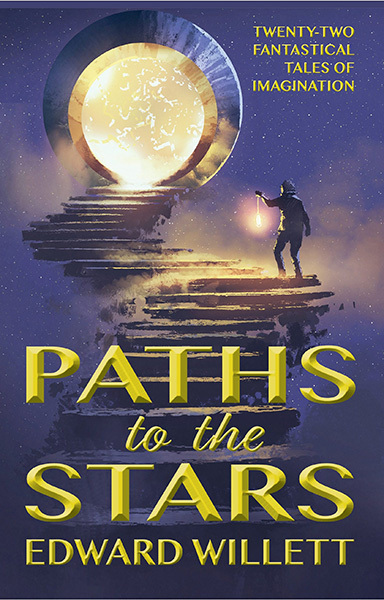 Paths to the Stars gathers together 22 of Willett’s short stories, roughly a quarter of which are previously unpublished. The book was issued by Shadowpaw Press, an independent publisher established by Willett. Seven of the tales are set on earth, three on the moon, and the remainder outside our solar system. Though most of the stories are what I would consider science fiction, some shade toward fantasy, and a couple are horror stories, albeit mild ones. Some were originally targeted for a juvenile/Young Adult market. Prefacing each story is a brief comment by Willett, outlining the publication history of each piece and, in some cases, the inspiration or background. I found this aspect of the book intriguing, as it gave me insight into some of the drivers behind the stories. For example, the story “The Strange One” was inspired by information Willett had run across related to hibernation. For “Moon Baby,” Willett’s starting point was this: “what would it be like, I wondered, to be the first human born on another world…?” (140). As Willett explains in the introduction to “The Daydark,” religion played a large role in his early life. He attended church several times a week and his father was a “preacher, teacher, deacon, and eventually elder in the church” (p. 161). It is not surprising that religion provides a philosophical underpinning, theme, or background in a number of the stories. In “Sins of the Father,” strong beliefs drive an unlikeable protagonist’s actions. Other stories, like “The Path of Souls” and “I Count the Lights” include depictions of alien belief systems. “The Devil’s Architect” is a darkly humorous take on how our descendants might try to shape their experiences in the afterlife. In some cases, the story’s introduction provides information about how Willett’s life experiences have influenced the theme or content. “Strange Harvest” was inspired by Willett’s days as a reporter in Saskatchewan, when “every spring, people would bring in funny vegetables: tomatoes with noses, potatoes that looked like John G. Diefenbaker…” (31). Willett’s bio addresses his past experience as an actor and singer, and this knowledge provides depth to the story “A Little Space Music.” Not all of the stories bear the stamp of Willett’s unique experiences, but the fact that some do is one of the book’s strengths. The stories in question aren’t boilerplate tales that just anyone could crank out—they have an added dash and depth as a result of this feature. Another of collection’s strengths is Willett’s willingness to come up with new ideas about how things might be done. Many books, shows, and movies solve the issue of translation between species with some kind of machine or device. In “Lost in Translation” Willett digs deeper. In this story, translation between species is performed by the Guild of Translators, which recruits individuals with empathic tendencies. Translators have a code of professional ethics, and the mechanism of translation involves the temporary implantation of a “genetically engineered artificial life form, a universal nervous system interface designed to augment [the translator’s] own natural empathic powers” (185). Taking on the task of translation is physically uncomfortable as well as mentally demanding. Willett also notes the way that translators are sometimes set apart, even from their own kind, because those who listen to what they have to say “often could not separate them from the message they conveyed so perfectly” (191). With 11 of the stories set on other worlds, it’s not surprising that human-alien relations are a recurring theme in the stories. Tales such as “The Daydark,” “The Rescue,” “The Strange One,” and “Landscape with Alien” hint at the notion that our best chance of overcoming personal prejudices about aliens and their motivations may come through one-on-one contact. Not all of the stories have likable protagonists. In “The Wind” the lead character seems okay—until you get to know more about him. Danny, the protagonist of “Waterlilies,” is charming in a raffish way but is also self-centred, ambitious, and ultimately careless. In other stories, the protagonist was easier to empathize with. The mixture of story types provided variety. My favorite story was “A Little Space Music,” which details the trials and tribulations of a director preparing to stage a production of The Sound of Music aboard a space-faring passenger ship. There’s just one catch—the actors are all Squill, large slug-like creatures. Over the years, I developed a certain familiarity with the movie version The Sound of Music since it was one of my mother’s favorites. This knowledge allowed me to get the full benefit of Willett’s use of humor in this piece. However, there are a lot of laughs to go around even if you don’t know the names of the characters and the songs in the musical. Any book has it weaknesses. In the case of Paths to the Stars, I confess that I found some of the stories less engaging than others. For example, I felt the antagonist in the story “Texente Tela Veneris” was overdone and a bit stereotypical, and wondered whether the same end might have been achieved by portraying him in a more nuanced way. In the story “The Wind,” I had a sense where the story was heading before I got to the end, which may or may not have been intentional on the author’s part. In the dedication to the book, Willett notes that his goal in releasing Paths to the Stars was “in the hope I could move and entertain readers as much as I have been moved and entertained.” Certainly, Willett’s short story collection has much to offer. Between the pages of Paths to the Stars, readers will find both inner and outer journeys. Some of the characters find what they are hoping for, and are pleased by it. Others get what they thought they were looking for, but realize it’s not at all what they expected. We get to experience alien cultures and strange worlds, and witness strange happenings in our own world. For a speculative fiction collection, that hits a lot of bases.